A large chicken coop and storage barn caught fire on Tuesday, Dec. 4, 2018 killing about 600 chickens at the Little River Farm on Mine Hill Road in Fairfield. 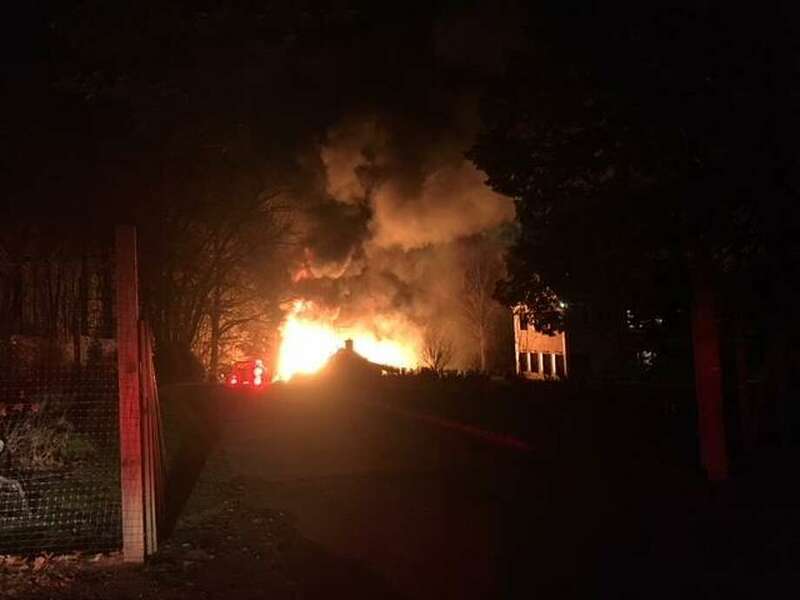 FAIRFIELD — A large storage barn and chicken coop caught fire early Tuesday morning, killing about 600 chickens at the Little River Farm on Mine Hill Road. Firefighters also rescued a man who was sleeping in a house about 25 feet from the burning barn. Assistant Fire Chief Roger Caisse said the coop was part of the barn that stored farm equipment. The fire was reported at 4:52 a.m. on Mine Hill Road. The first arriving fire unit led by Lt. Mark Harry reported heavy smoke and fire coming from a 5,500-square-foot barn with fire exposing an adjacent occupied house. The lone occupant of the house was rescued from the exposed structure and led to safety by firefighters. He was not injured. The family that lived in the house was found about 100 feet from barn fire. They reported finger laceration injuries from their attempts to release the chickens from the burning barn. “Firefighters were unable to enter the building, but were able to apply cooling water to the propane tanks located in the building to avoid an explosion,” he said. The fire was brought under control in about 30 minutes. The cause has not been determined. Along with firefighters and officials, personnel from the Department of Energy and Environmental Protection and the Fairfield building and health departments responded. Westport and Bridgeport fire departments also provided mutual aid and fire coverage for Fairfield stations. According to Little River Farm’s website, in November 2014, Felix and Olivia Charney were looking for land to build their home. They purchased the nearly 9 acres of land on Mine Hill Road in the town’s Greenfield Hill section. Over the years, the farm was expanded to include hundreds of fruit trees, egg production and vegetable and fruit crops. The farm also sells produce in season at a farm stand Olivia Charney designed on site and at area farmers’ markets and local stores.